It’s been a minute since we hosted our last Affiliate Referral Contest (in 2012 to be exact, yikes!) and we thought it was time for another one! We hope to hold these contests on a more frequent basis because who doesn’t like prizes?? Did you know Black Chicken Host has an affiliate program? We are grateful to our affiliate partners for helping us spread the word about our services they are currently the only source of our “advertising”! Because we know you’re putting time and effort into promoting us, we want to reward you even more than the $5.00 bonus just for signing up and the 3% monthly commission for the lifetime of referred accounts. This commission is applied to your account as account credit which can be used to pay any of your invoices – domain orders and renewals, hosting packages, SSLs, anything! 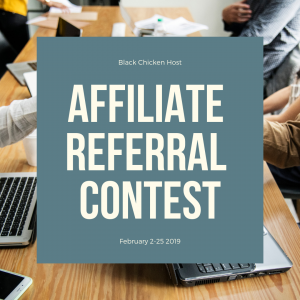 Starting Saturday, February 2, 2019, we’ll be launching an affiliate contest! Feel free to promote your affiliate link however you want, there are no limitations! You can place a button on your website, write a review of our services, post to Twitter, Facebook, and other social media, put a link in the footer of your newsletter, etc. Fraudulent orders will be cancelled & cannot count toward totals – we know you’d never intentionally refer a fraudulent party! If you’re not signed up for affiliate rewards yet, there’s still time! 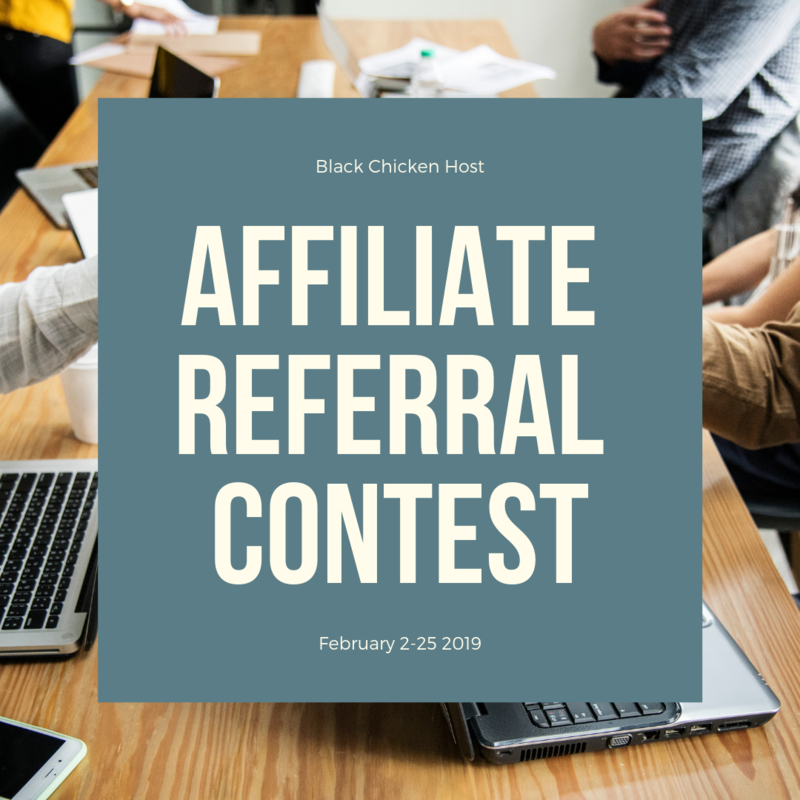 If you would like to sign up for our Affiliate Program, you can do so via this link after logging into your Black Chicken Host Customer Portal. Note, you must be an active Black Chicken Host client with active services to qualify for our Affiliate Program. Ready, set, go! Let’s keep growing our Black Chicken Host community! This entry was posted in Affiliates, Blog and tagged affiliates, contest on February 1, 2019 by hannah.